I have external WD NTFS hard drive which was used as a backup drive for domain controlled Windows 7 laptop. Recently I have system reinstalled and moved to another laptop under the same domain username. 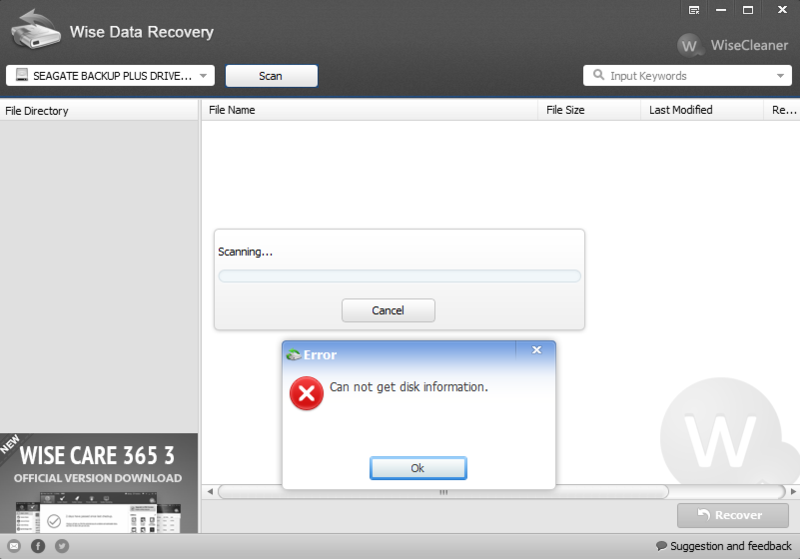 Now I'm trying to restore several accidentally deleted files from external hard drive using Wise Data Recovery. 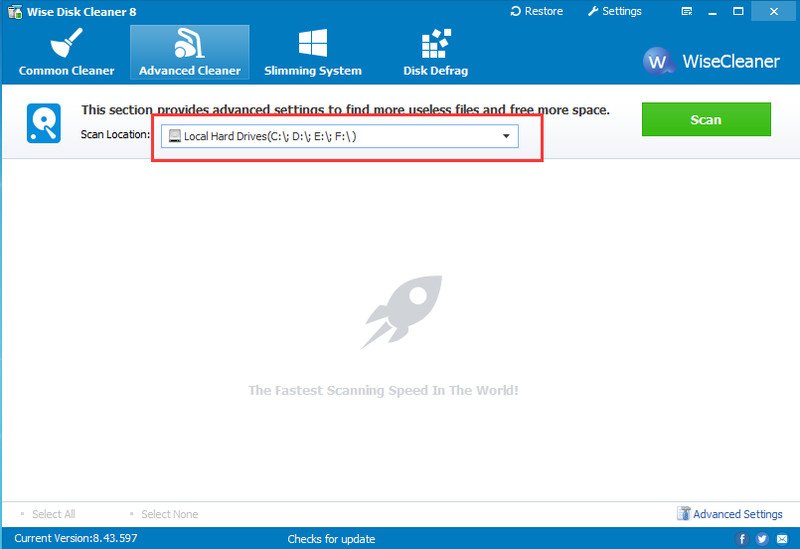 After selecting drive and pressing scan I receive error message saying "Error - Cannot get disk information"
Permissions were checked and forcedly set to a new user and then to Everyone full access. But this did not solve the problem. CHKDSK was run but no error, just fixed some index entries. Any hint or idea how to solve this and get scanning done? Can you upload the Disk Management screenshot? I want to know your disk info. Can you tell me the model of the backup disk? The disk seems normally, haven't used special tech. 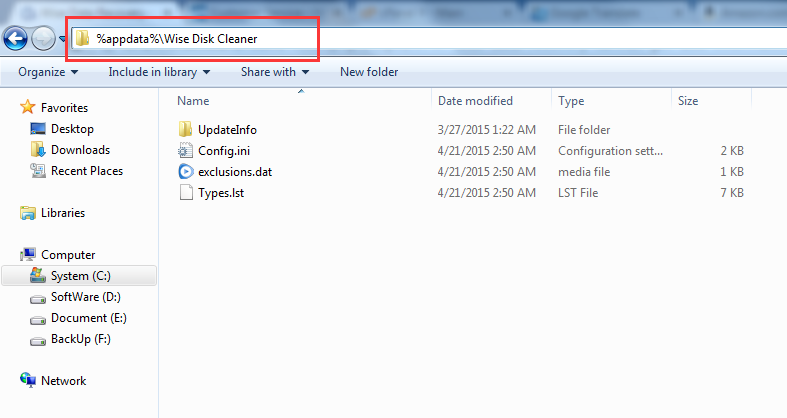 please do me a favor, install Wise Disk Cleaner, open it, then click Advanced Cleaner. Does it recognize your Backup Drive? If not, please open %appdata%\Wise Disk Cleaner, find the file - errorlog.txt and send it to me. Downloaded, overwritten old one, but the output is still the same: no disk visible in Advanced tab, also as there is no errorlog.txt generated. A error found:The drive - F has a unknow file system. Please try this file, replace the old file, then we can know exact reason. A error found:Read drive:F error. Please try this file, replace the old file, it should works fine. Now there are no new messages in errorlog, the disk becomes visible in Disk Cleaner, but cannot find anything to clean. Latest updated WDR still generates the same error. Are you sure the errorlog.txt is blank? We want to buy a disk to test (same as yours), but I cannot find it, are you sure the model is SRD0SD0 ? The message "File record Segment" (From 25-29, one line after another) "unable to read", means the disk has bad segments. all saved files were lost. some software can segregate these bad segments, then you could continue to use the disk, But it is not safe, someday you may lost the whole disk. We suggest you to change a new disk. 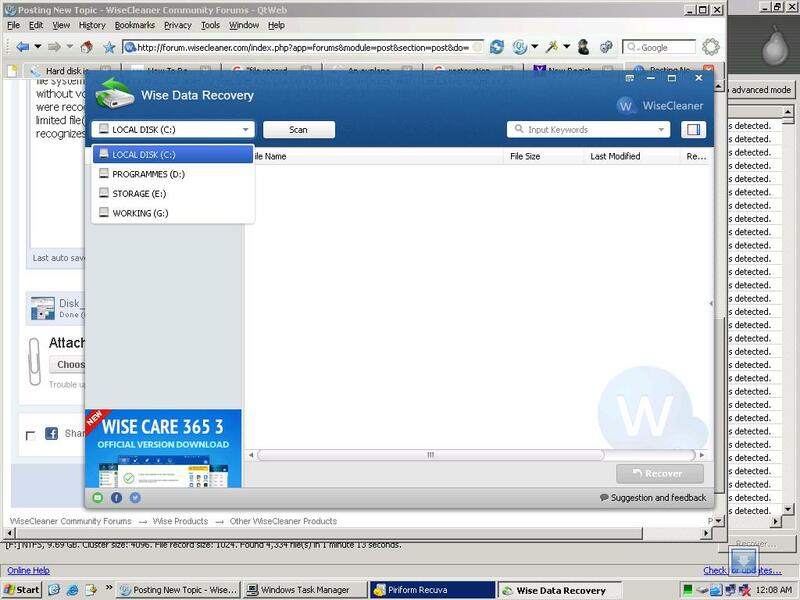 Wise Data Recovery is a free software, it just supports a simple data recovery, can't do the deep scan and recovery. Sorry, we can't help you. Please try other programs. @admin. Thanks for your prompt reply. Ok I can understand and appreciate your advice. Any how followed your advice and used Recuva which served the purpose. Hope you can recover the lost files. Installed latest version today, and it does not show my CD Drive. CD's are removable, so I though your program would work with them. What do I do? I also can't see my CD/DVD Drive (without or with a CD/DVD in it). Using Windows 10 home x64. Maybe this operation is not supported, but anyway wait for a more authoritative answer by WiseCleaner_Admin (or WiseC. employees/moderators).